Both a bathroom and a bedroom or kitchen, it can be a stay that develops within a few meters, which is why we test our imagination and to implement the best tricks for decorating small spaces. To make these rooms of the house can look as beautiful as functional and current; today we focus on two simple tricks to bring a touch of style and comfort to this interior. The shelves and racks can be a great solution when it comes to decorating small spaces. They are versatile; they are suited to all types of space and any style, as we can get them in different sizes, colors, designs and materials. 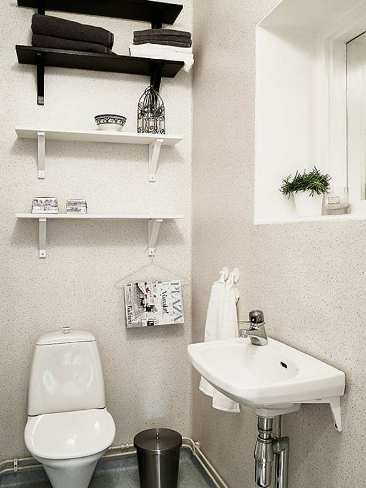 Here we will give you inspiration in this narrow bathroom, in which a series of shelves form a column in one of the walls. These shelves are excellent for added storage space in a room, and in this case to provide a decorative nod to set, the shelves have chosen two different colors. An idea to aim and you can adjust the colors you want for your bathroom. Then another decorative tricks that stands out for its simplicity but does not lose ingenuity and creativity. It is a simple clothes hanger that functions as a useful magazine rack. Simply take a clothes hanger and hang it on a hook or hanger you have in the room, this bath is held in one of the squares of the series of shelves. A simple idea and perfect for hanging magazine and even use as a coat hanger. Go ahead and try these decorative alternatives in your home.